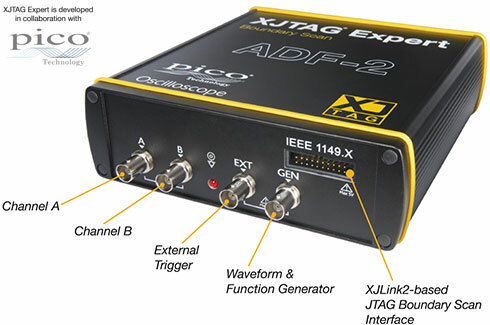 Even with its advanced digital features, XJTAG Expert ADF-2, requiring just two USB connections, can be used with a laptop PC. The unit can also supply power to small target boards enabling them to be tested without a source of mains power. You only need a simple cable assembly to connect XJTAG Expert to up to four JTAG chains on your target board. The configurable 20-way connector simplifies the process of connecting your XJTAG test system to the UUT. XJTAG Expert ADF-2 can be configured to work in the best way with your board. If there are signal termination issues, they can be overcome by selecting an appropriate drive strength and slew rate. Configurable voltage levels allow you to connect directly to most TAPs while the advanced automatic skew control enables you to get the maximum frequency out of your JTAG chain and cable. The digital oscilloscope has high bandwidth and high sampling rate. The ETS mode boosts the maximum effective sampling rate further to 10 GSample/s, allowing more detailed display of repetitive signals. Buffer memory depth is 128 MSample. The maximum zoom factor is 100 million, with a choice of two zoom methods and zoom controls. Each captured waveform is stored in the buffer; you can review thousands of previous waveforms. A class-leading set of advanced triggers including pulse width, windowed and dropout triggers helps you capture the data you need. The spectrum analyser allows signals up to 200 MHz to be viewed in the frequency domain. A full range of settings give you control over the number of spectrum bands, window types and display modes: average, instantaneous, or peak-hold. You can display multiple spectrum views with different channel selections and zoom factors allowing you to see these alongside time-domain waveforms of the same data. A comprehensive set of automatic frequency-domain measurements, including THD, THD+N, SNR, SINAD and intermodulation distortion can be added to the display. The built-in function generator produces signals such as sine, square, triangle, DC level, etc. Basic controls set level, offset and frequency whilst advanced controls allow you to sweep over a range of frequencies. Combined with the spectrum peak hold option this makes a powerful tool for testing amplifier and filter responses. Using the built-in full arbitrary waveform generator (AWG) editor, waveforms can be created or edited, imported from oscilloscope traces, or loaded from a spreadsheet. With its deep memory, the serial protocols analyser can capture thousands of frames of uninterrupted data. Protocols currently included are CAN bus, I²C, SPI, RS232 and UART. The decoded data is displayed in the format of your choice: “in view”, “in window”, or both at once. You can zoom in on these frames to look for noise or distortion on the waveform. The “in window” format shows a list of the decoded frames, including the data and all flags and identifiers. You can set up filtering conditions to display only the frames you are interested in, search for frames with specified properties, or define a start pattern that the program will wait for before listing the data. You can also create a spreadsheet to fully decode the hex data into plain text. Frequency-domain measurements: THD, THD+N, SNR, SINAD, etc.